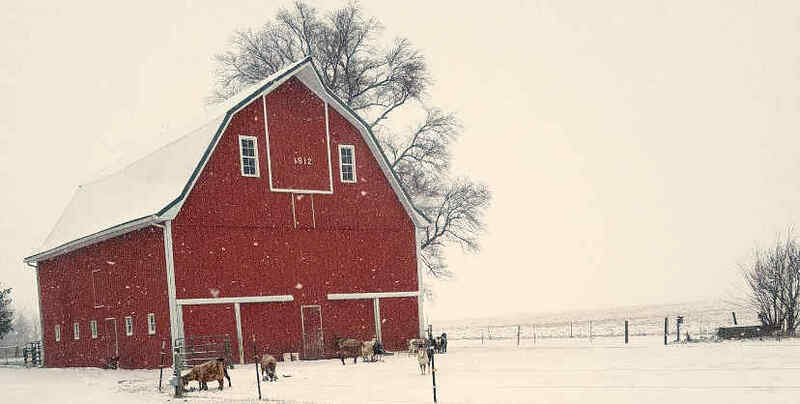 Red Barn Farm is where I moved (I’m Jill, the youngest of the Brockman siblings) with my husband Will and our two small daughters in 1998. It’s part of the Brockman Family Centennial Farm, where 5 generations of our family have lived, including our own four daughters. 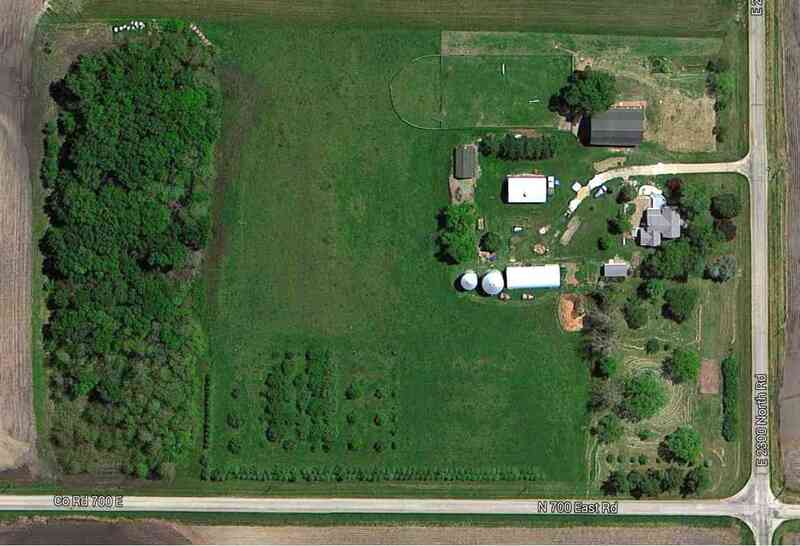 We own the family farmhouse, and the 5 acres around the house and out-buildings shown in the aerial view. Our family's remaining 135 acres were transitioned to certified organic production in 2004 by our neighbor Harold Wilken and his son Ross. In 2017, the Wilkens launched a stone-ground milling operation, and I became the miller for The Mill at Janie’s Farm, part of the Artisan Grain Collaborative. The fields are a diverse mix of food-grade crops including black turtle beans, popcorn, spelt, emmer, rye, oats, wheat (many varieties), corn (ditto), and other grains. Even greater biodiversity is found around the farmhouse and barnyard, where our family produces organically grown (but not certified) apples, pears, and hazelnuts. We also grow aronia berries, blueberries, strawberries, plums, peaches, and cherries for family use. Our family garden provides dozens of kinds of vegetables, and animal husbandry produces goat milk and meat, chicken and duck eggs, and chicken and duck meat. 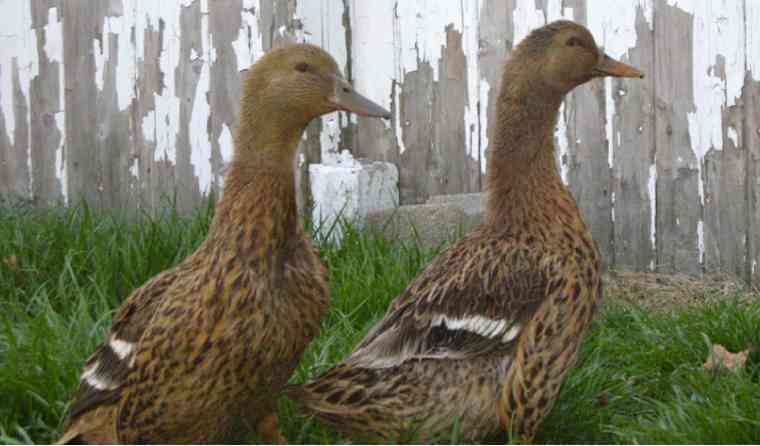 Our farm also hosts peacocks and guinea hens, as well as honey bees, and the children have rabbits, dogs, cats, a guinea pig named Charlotte, and a horse named Cowboy. The animals provide food for the family, milk for the soaps, manure and mulch for the fruit and vegetables, and entertainment for all. As Red Barn Farm was transitioning to certified organic grain and hay production, we continued to add to our apple orchard, choosing some old heirloom varieties such as Cox's Orange Pippin and Nutting Bumpus, as well as some blight resistant varieties from the New York experimental station such as Liberty and Redfree. With careful pruning early every spring, and regular applications of “Surround,” a mixture of fine kaolin clay and water, we’ve been able to raise beautiful apples that taste like apples used to taste – crunchy and bursting with juice and flavors. Red Barn Farm has about 100 fruit trees, including dozens of varieties of both apples and pears. 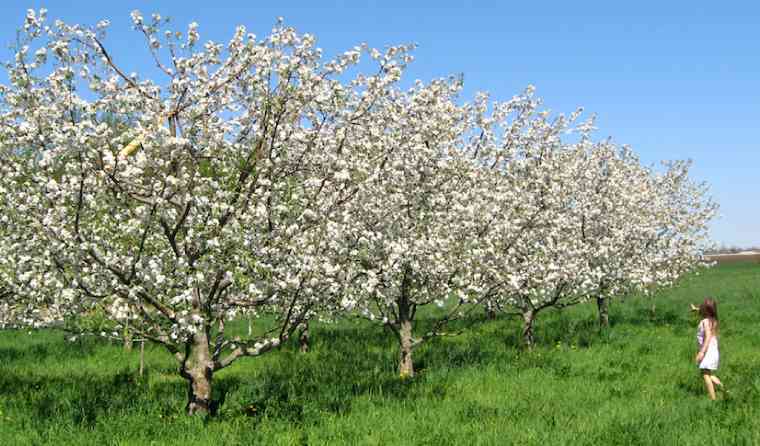 As the apple and pear trees have matured, the amount of fruit has steadily increased, as has the labor involved. Machinery and other on-farm infrastructure for small orchards is hard to come by, but we were finally able to locate an apple washer from an Illinois orchard that was going out of business. This piece of equipment has made the orchard operation more efficient, as has the cold room we were able to build, thanks to a grant from the Frontera Farmer Foundation. Next we hope to find an old hydraulic press to make our own apple cider. 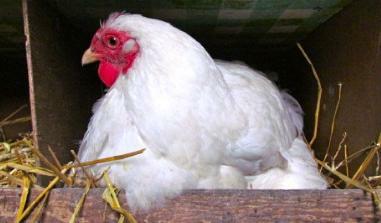 The primary way that Red Barn Farm is sustainable is through its large diversity of plants and animals. This is the traditional way that farms sustained themselves before government subsidies. If weather or other unforeseen events occur that negatively impact the animals or one variety or type of fruit, we know we can still make an income with the others. Red Barn Farm is traditional in one other sense: the milking of goats, collecting of eggs, picking of apples and pears, and making of soap is all done by hand. As our four girls grow older, they help more and more, continuing the century-old way of life on the farm. Before we talk about Red Barn Farm’s pure and gentle goat’s milk soaps, you need to meet the goats! Alvin, Rosa, May, Bambita, Bonita, Bette, Spicy, Fiona, Nutmeg, Monsieur, Delta, Clementine, Adelaide, Virginia, Chamomile, Frappucino, Annabelle and Lily . . . these are some of the many goats in our family, each with their own personalities. 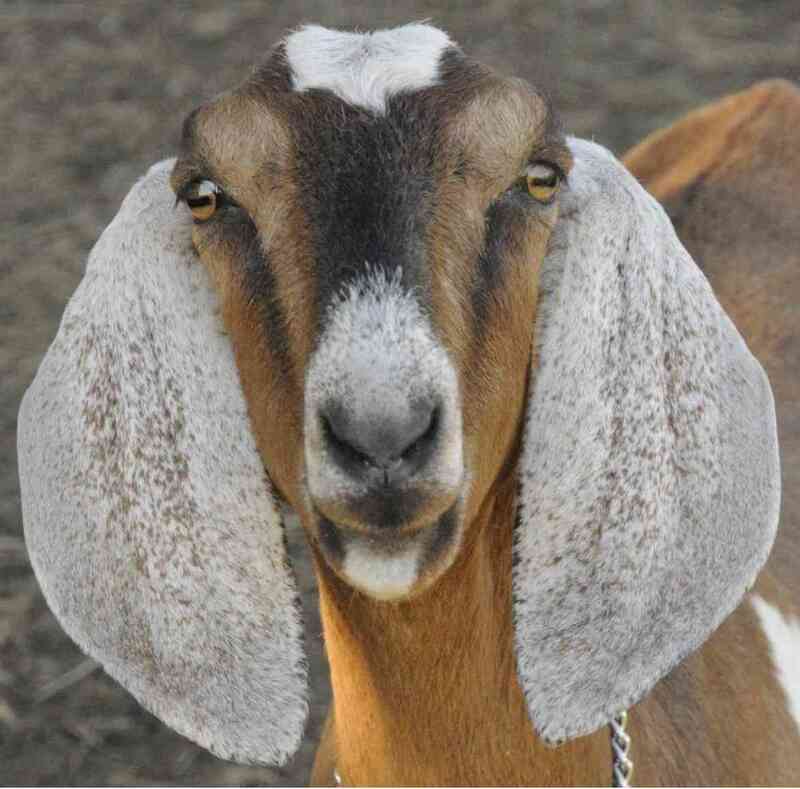 The does (female goats) provide rich milk, which is the key ingredient in our luxurious goats milk soaps. Historians tell us that Cleopatra regularly soaked in a tub of warm goat milk . . . and no wonder! Goat’s milk has shorter casein protein strands, allowing skin to absorb the fats, vitamins, and minerals (calcium, potassium and magnesium) in the milk. Provitamin B5 regenerates skin cells giving your skin a softer feel. Vitamin A improves skin elasticity and tone helping with lines and wrinkles. Improves collagen density and smoothes skin surface. Vitamin C An anti-oxidant which improves skin elasticity and general health. Vitamin D sustains healthy skin tissue. Vitamin E protects from oxidant damage. Moisturizes, anti-inflamatory, and offers healing and anti-aging effects. Unlike soaps from the store that contain a host of hazardous chemicals such as formaldehyde and artificial fragrances, Red Barn Farm soaps’ other main ingredients are organic olive oil and organic cold-pressed coconut oil. 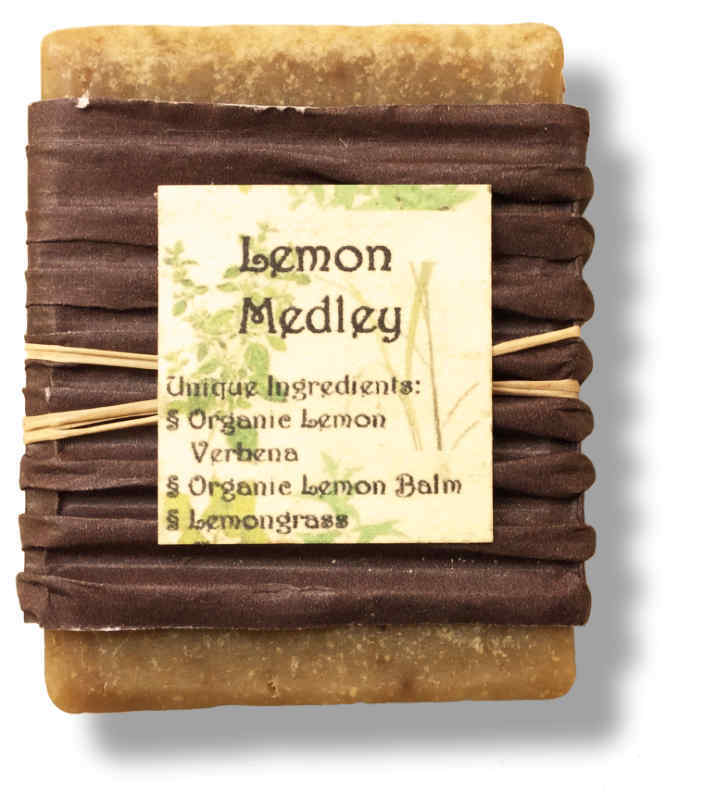 Then we add a variety of our own organic herbs, plus other organic spices, essential oils, oatmeal, and even aronia berries to make an ever-changing number of kinds of soap. We also have seasonal specialties such as Indian Summer and Frankincense and Myrrh. Many people who have delicate or dry skin, or chemical sensitivities, have told us that these soaps are the only ones that they can tolerate. 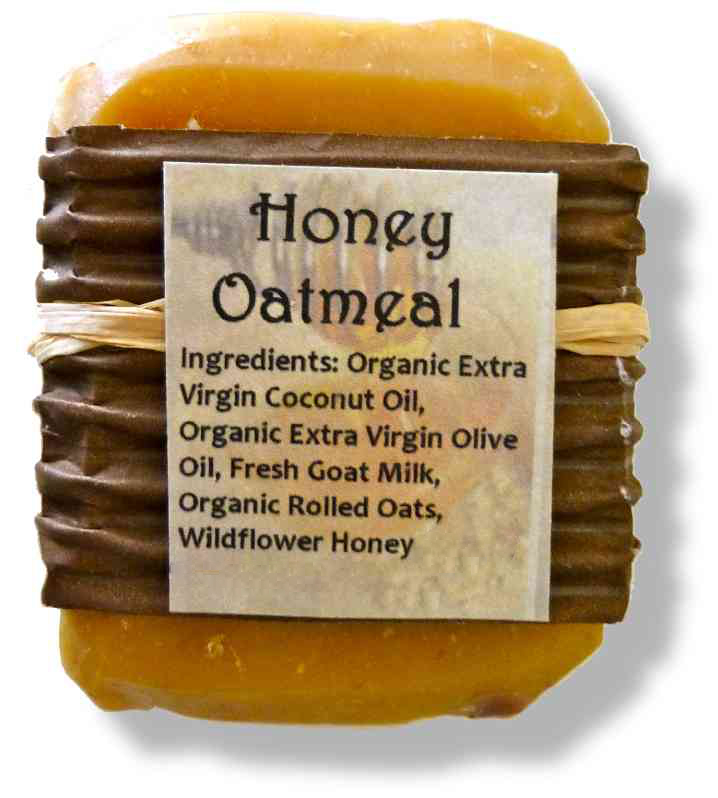 Others say these soaps leave their hair and skin softer and smoother than any other soap they have ever used. We think you’ll agree. These liquid soaps are the most recent addition to our goat milk soap line-up. Responding to customer demand, we began experimenting with recipes for a liquid soap with no chemical thickeners, perfumes, or other additives. After much trial and error, we hit the jackpot! We shave our Snow's Simple Soap and dissolve it to make a mild, safe soap that's gentle but effective. Our soap is slightly thinner than commercial liquid soap, which contains chemicals to make it thick and goopy. Even though our soap is thinner, you still only need a very small amount to lather up nicely. We tell people to squirt it in their palm, not on their fingers, so it doesn't run through. We continually change the natural scents in our liquid soap, but almost always have French Lavender, Citrus Spice, Lemon Tea Tree, Bergamot Mint, Rosemary, and Lemongrass — as well as unscented. 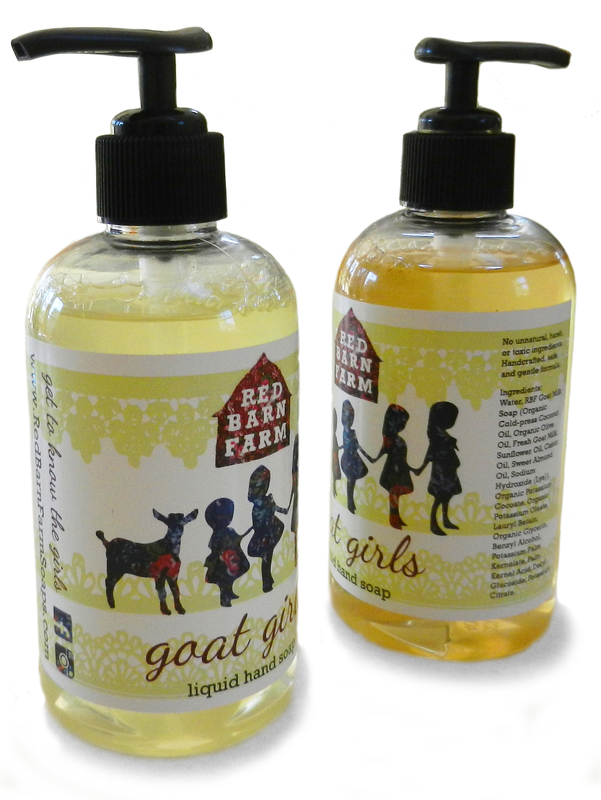 The label on our liquid soaps was designed by Jill's daughter, Halley, and depicts all four of Jill's goat girl daughters! Once Jill and her family moved there, she realized that dangerous cocktails of agricultural chemicals drifted into the farmhouse all the time. Whenever the spray rigs approached, she’d rush to shut all the windows and then run outside to get the clothes hanging on the line. Often she’d have to wash them again and hang them out later, hoping the chemicals would not volatize and again drift on the clothing that would be in intimate contact with her babies’ skin. Finally she laid down an ultimatum: the farm would have to transition to organic production or she’d have to leave. And so, after offering the long-time tenant the opportunity to use organic practices, we found a new tenant. Harold Wilken and his son Ross transitioned the farm to certified organic production and since then, they have transitioned over 2,500 nearby acres to organic production. The Wilkens also launched a mill to turn their grains into stone-ground organic flour for professional and home bakers and asked Jill to become the miller. Remembering the artisan breads and pastries from her time living in Luxembourg and France, Jill said yes. And each day she commutes the three miles from the farm to the mill past amber waves of organic grains. Get inside information about what's happening on Jill's Red Barn Farm, Henry's Farm and Teresa's Farms. Plus get a sneak preview of what's coming to the Evanston Market (including specials! ), and suggestions for what to do with all the bounty! 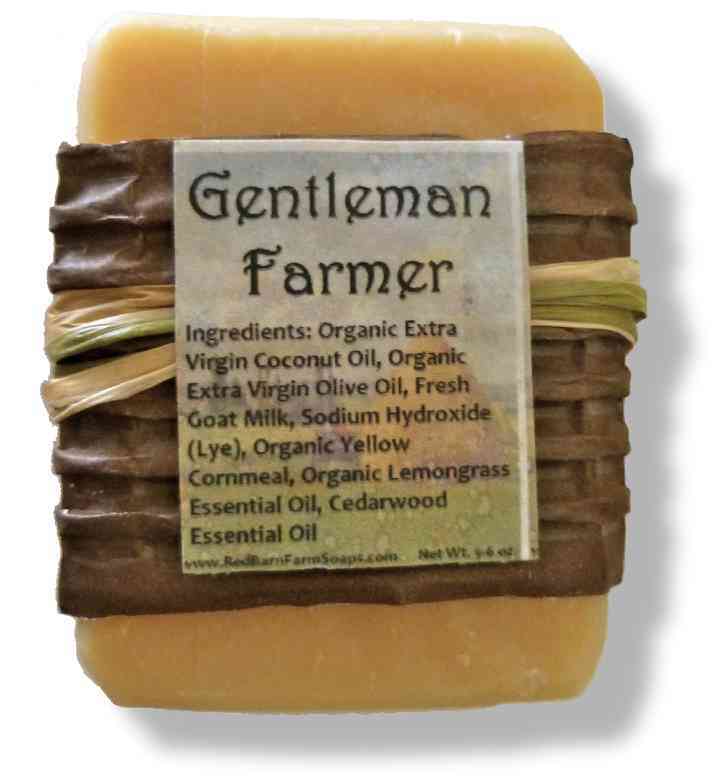 We are happy to ship our goat milk soaps to you. Please send us an email with your order, and we will be in touch about shipping details. Please enter your email address in this field. If you are in the Bloomington/Peoria or Evanston/Chicago area, we can arrange to deliver your soaps to you, as follows. 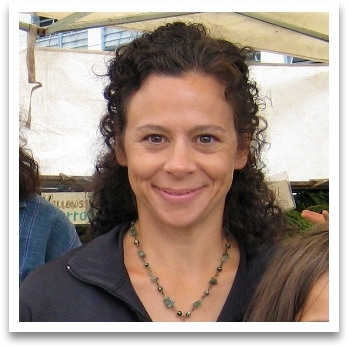 If you're a member of Henry's vegetable CSA or Teresa's Fruit CSA, Teresa will make sure you get your soap order at your regular CSA pick-up location. If you are not a CSA member, you may pick up your order at Sunny Lane Farm at 302 W. Sunny Lane, Eureka. If you are in Evanston or Chicago, we can arrange for you to pick up your soaps at Teresa's Fruit & Herb stand at the Downtown Evanston Farmers’ Market during May or June. At other times of the year, we will ship your soaps directly to your home. Just hit the Email button above.